Take all the ingredients except ghee/ melted butter in a bowl and beat them well until the sugar dissolve. Now take the mix in a pan and put it on a medium heat. Stir the mix continuously until all the water dries out and the egg mixture become lumpy. Take out the egg jorda on the serving dish. Garnish it and serve warm. With a sharp knife or kitchen shears, carefully cut top side of lobster shells lengthwise and pull apart the shells slightly. Take all the ingredients in a bowl and mix well. Now put the cut lobster tail in the mix and marinate it with the masala. Then keep it marinated for around 15-20 minutes. Seasoned the cut Onion, Carrot, Bell pepper with some salt and black pepper and set aside. Preheat your broiler to the broil setting. Spray or brush the baking tray with little oil. Put the marinated lobster tails on the tray, brush little bit oil on the tails and put the tray on the broiler. Powdered Sugar- around 1/2 cup + 2 Tbs to dust on the top. Place a wax paper or parchment paper on the baking tray. Brush some oil or butter on the paper and set it aside. Add the crushed nuts, grated coconut, sugar, baking powder and orange zest in the beaten egg and mix all the ingredients well. After placing all the cookies on the tray, dust the top with powdered sugar. Preheat the oven to 350 degree F. Place the baking tray on the middle rack of the oven and bake the cookie around 10-12 minutes or until the cookie turn to a nice golden brown color. Take out the cookie from the oven and keep aside to cool down to room temperature. Serve your cookie. Keep the left over cookie in a air tight container. Soak dal in water for 15-20 minutes. Then wash it and set aside. Now heat oil in a pan. Add the chopped onion, green chili in the hot oil and fry them for few seconds. Then add the dal, turmeric powder and salt; and fry them for 3-4 minutes. Now add around 3/4 cup water and cover the pan. Let it cook for around 4-5 minutes or until dal become soft (dal should not be mashed). Spread the chopped coriander leaf and turn off the heat. Serve dal vuna with Ruti or Parata. Soak sabudana in 1 cup of milk for around 1 hour. Boil 2 liter milk in a heavy bottom saucepan and reduce it to around half (remember to stir the milk continuously during boil, otherwise it will burn in the bottom). Add the cardamom and cinnamon in the milk. Now mix the custard powder in the milk where sabudana are soaked (do not add the custard powder directly in the hot milk, it will make lump in the milk) and then add them in the reduced milk. Remember to stir during mixing. Then add the sugar and stir the milk until sabudana become transparent and bigger. Then add the chopped nuts and raisin, stir for another 6-10 minutes and then remove payesh from the heat. 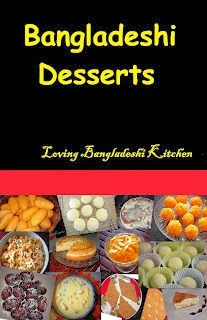 Let payesh to cool down and then serve.